Nicely designed to stay down over running shoes, but they wear out fast. 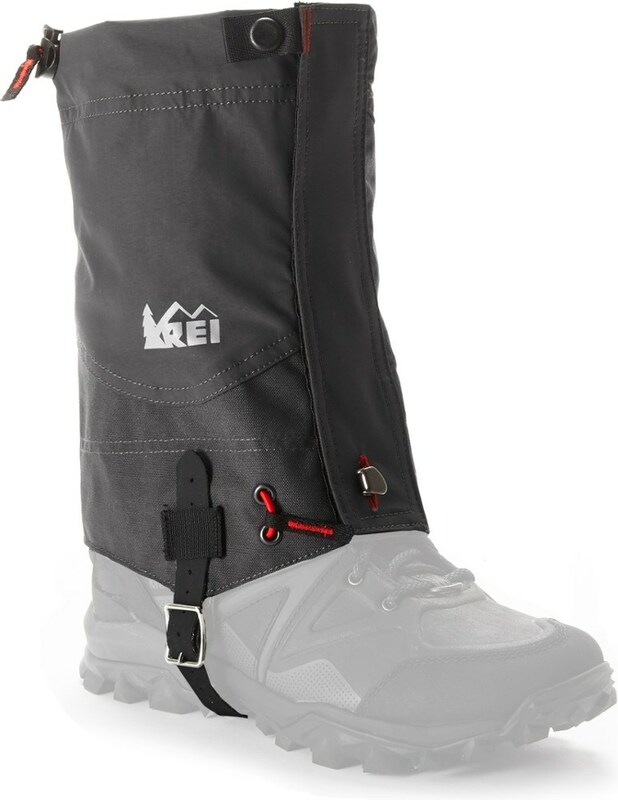 The gaiter material is slightly stretchy and breathes well, but the cords that snug the gaiters down over the foot aren't tough enough and it looks like the grommets will pull out after prolonged use. I don’t like running on asphalt, so here in Tucson one of my favorite running routes is a dry, sandy wash full of mesquite, palo verde, and cacti. Elsewhere in the Southwest I have run and hiked in tan-, white-, and even pink-colored sand dunes. During and after some of these outings I have experienced some foot discomfort due to gradual sand accumulation and ended up emptying significant amounts of sand out of my shoes. 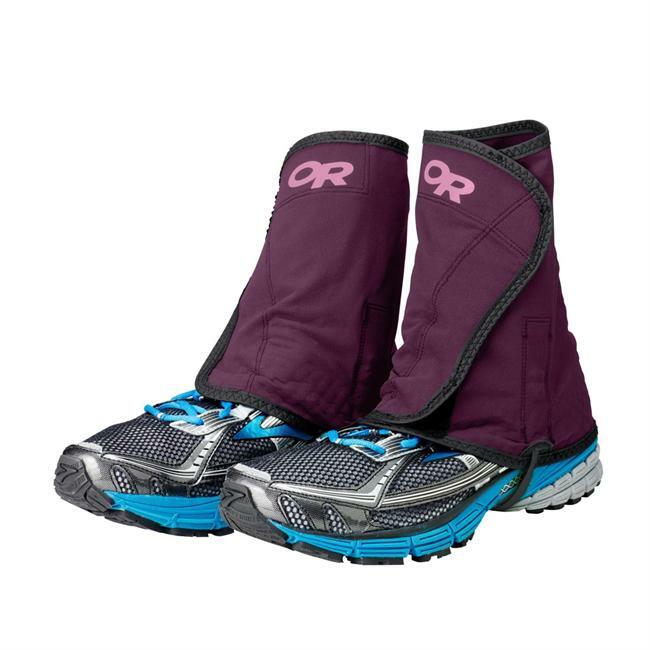 I have tried various kinds of gaiters and experienced the general problem that they just won’t stay down over the heels of running or low cut hiking shoes. 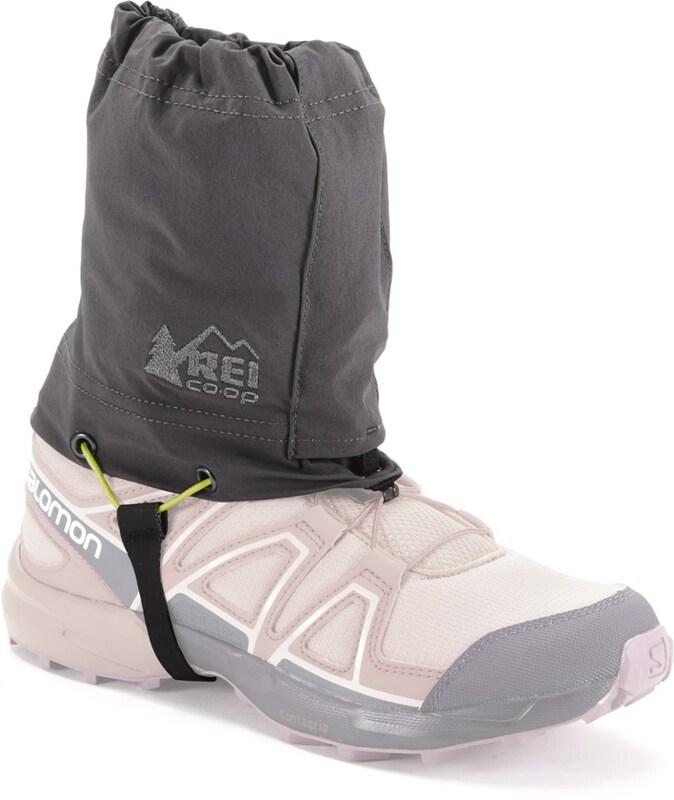 The REI Activator Gaiter addresses that problem by way of a clever design that cinches the gaiter snugly down over both forefoot and heel. There is no zipper, front or back, so the gaiter has to be pulled on over the ankle before putting shoes on. The ankle elastic is one-size-fits all, comfortably loose around my skinny ankles but snug enough to keep sand and gravel out. 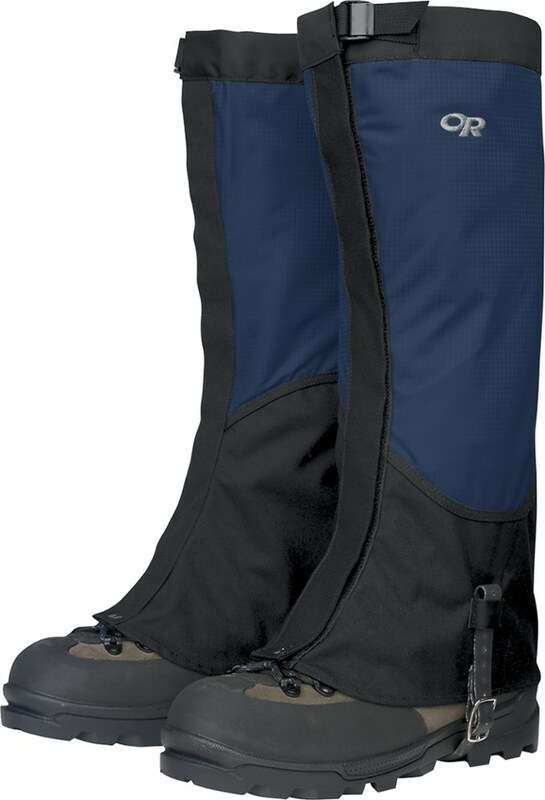 A single cord wraps around most of the base of the of the gaiter, with exits via small grommets on both sides so that the cord forms a V that runs through the Hypalon midfoot strap. The cord is cinched tight via a cordlock at the front of the gaiter, just above the lace hook. 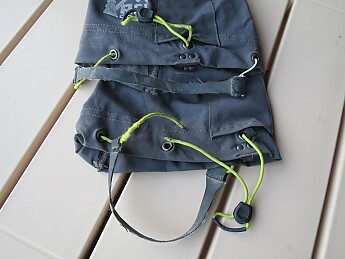 The cordlock and excess cord can be tucked away in a pocket on the front of the gaiter to keep it out of trouble. 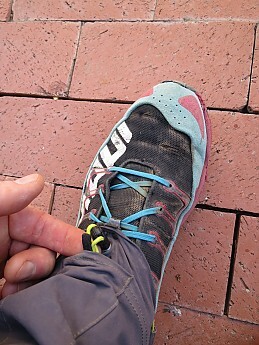 The V arrangement on the side provides enough downward tug on the heel to keep the gaiter down over a running shoe. 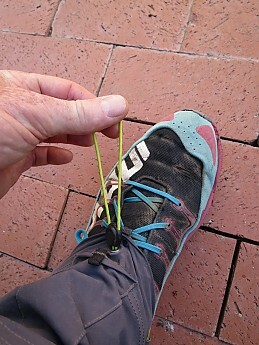 The quick-tighten cord makes it easy to get the strap under the sole of the shoe, something that is often difficult when you have the straps cranked down tight to stay down on a low shoe. 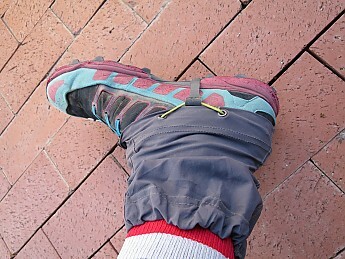 It’s possible to manually pull the gaiter up over the heel, but in my experience it will stay down for non-stop hikes and runs up to 28 km / 17 miles. This is all very smart and satisfactory, and the reason why I picked up a pair of these when I spotted them at REI. 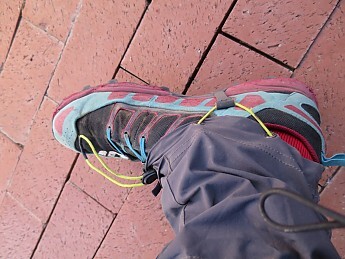 I have used them on a four-day hike on good trails in the Grand Canyon and some day hikes and runs on sandy and rocky trails and terrain around Tucson, totaling probably less than 160 km / 100 miles. It did not take too many of those miles before I noticed fraying on the sheaths of the crucial cords that make the whole arrangement work. Not too long after that the sheaths wore through, and on my last run in the wash one of the cords broke. The abrasion may be more due to rubbing on the grommets or heel strap rather than rocks or sand. The heel strap has a small piece of plastic tubing sewn in, presumably to allow free movement of the cord, but the tube has sharp-ish edges that may contribute to the problem. I wouldn’t expect these cords to last forever, and figured I’d have to replace them sooner or later (preferably later, of course). 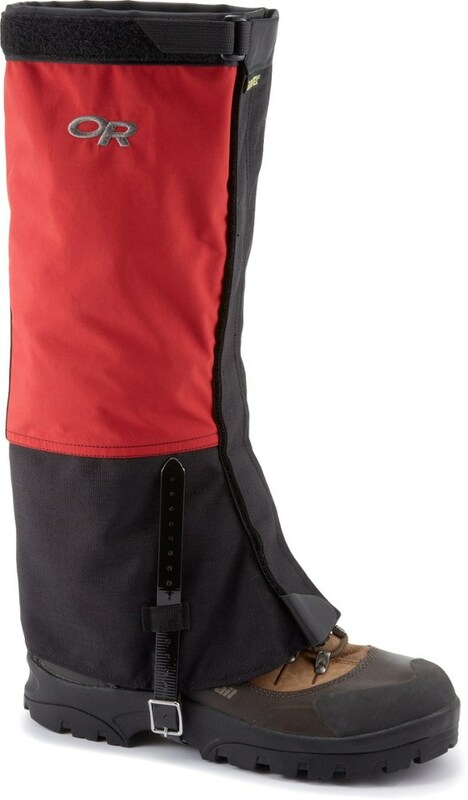 But they are sewn in to anchor them at the back of the gaiter, and they have to pass through the small grommets and be worked through the sleeves, so replacing them will be non-trivial. The Hypalon straps are also showing signs of wear. I think they should last a good while longer and would be easily replaced if the cord system was more replacement-friendly. 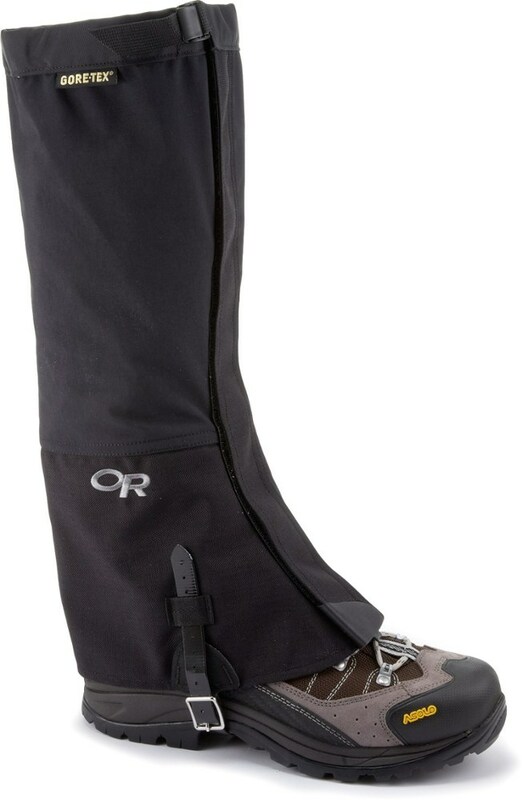 The gaiter fabric is light, breathable, slightly stretchy and quite comfortable even over bare ankles. The yang of that is that it may not be very durable—I’m not seeing a lot of abrasion wear on the inside ankles, but there is fraying around some of the grommets and they may eventually pull out. I would call this a promising start, but I think I REI needs to rethink or tweak the design to try to slow down cord wear, use a tougher cord, and make eventual replacement easier. The grommets are clearly a weak point. I will return them to REI. All the women on our JMT hike had Dirty Girls. They won't stay down without velcro on the heel, and the velcro won't stay on, but now some shoes (Altras) come with velcro built in. I juts got some ultras so maybe I'l give dirty girls a shot. I've liked mine for the price and simplicity (some heavier ones were too stiff I found), but you're right about the velcro issues. 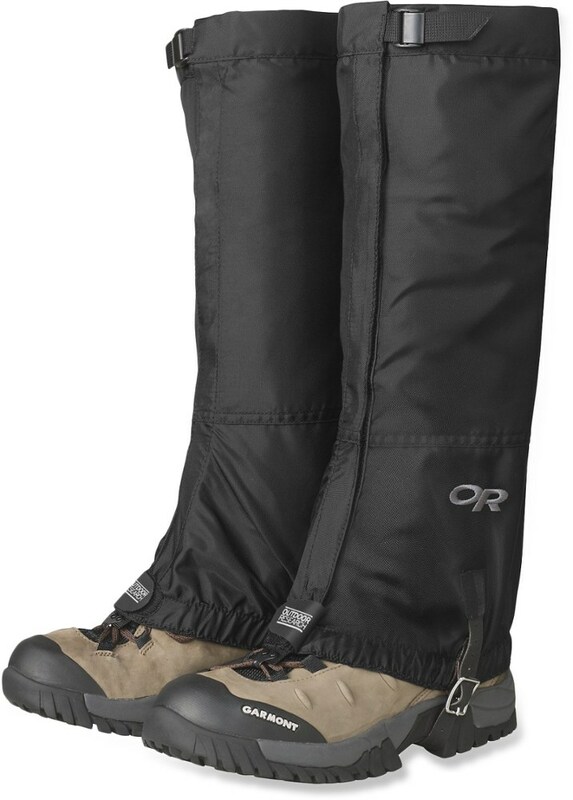 Plus, since Altras are coming out with gaiter traps now, if you have shoes and gaiters that can work together I'd give those a shot (and report back! ).